WWDC10 Day 1: iPhone 4 and a new iPad? The WWDC10 started today in San Francisco and by now you have all heard the news. The biggest news today was delivered by none other than Steve Jobs himself during his Keynote. That announcement was the a naming of the new iPhone we have all been waiting for. Jobs announced the name as a graphic dropped onto a blue screen with an added smoke effect as the “iPhone 4“! Yes the iPhone 4. Not HD, 4G or 4GS as most of us had guessed. Jobs likes to keep it simple and to the point. It is the 4th generation iPhone and has nothing to do with 4G. The iPhone 4 is the same model that had been leaked by Gizmodo a few months back. Jobs made a reference about the Gizmodo leak regarding the new design by jokingly saying “stop me if you’ve already seen this”. The design is boxier compared to the 3rd generation iPhone but I think it is an improvement. My 3GS can be difficult to hold with its beveled back design. Jobs told the audience at the conference that there are “well over 100 new features” on the iPhone 4 but he could “only share 8 of them” on Monday. He showed off the design saying it is “one of the most beautiful things we’ve ever made” and he also added the new iPhone is “really thin”. The new design is 24% thinner than the 3GS which also makes the iPhone 4 the thinnest smart phone in existence. The iPhone 4 adds better glass and stainless steel making it shine. The new design features glass and stainless steel. It is a beautiful, fine crafted almost retro design. The new Retina Display was by far the best feature on Monday. The media was impressed with its clarity and sharp resolution. You can view email, read books or scan web pages with crisp text. This is all possible by adding 326 pixels per inch or by packing four times the number of pixels into the same 3.5-inch screen. Click HERE to view a comparison of the iPhone 4 display versus the iPhone 3GS display. The new glass is also said to be harder, more scratch resistant, and more durable. An oil-resistant coating is added to keep the screen clean. The model shown on the WWDC10 screen featured the screws in the bottom by the speakers. There was speculation on the final design as two different models were leaked in which one had screws and one lacked the screws. The screws would have to be there to allow users easy access inside of the phone. On the left side of the iPhone you will find the mute and volume buttons. The volume buttons have been separated into two separate steel buttons ( + and -) versus the old single volume button design on the 3GS. On the opposite side of the volume and mute buttons you will find the micro-SIM tray. The front features the home button, the receiver and now the new Front-Facing Camera. With the front-facing camera a new feature called Facetime will allow users to make video calls. On the back is the camera and the newly added LED flash. The bottom has the microphone, 30 pin connector and the speaker. The top features a second mic for noise cancellation, a headset jack and the sleep-wake button. The lines or cuts that break up the smooth steel band on the sides and top are there for a purpose. Those 3 lines are part of the brilliant engineering of the iPhone 4 which uses the steel band as separate integrated antenna systems. One side of the band uses its antenna for Wi-Fi, Bluetooth and GPS, while the other side of the band uses its antenna for UMTS and GSM. This is the first integrated antenna engineering of its kind. Along with the stainless steel there is glass on the front and the back for optical quality and scratch resistance. Pre-order or reserve yours on June 15. Arrives June 24th in the U.S. France, Germany and Japan. Retina glass is harder, more scratch resistant, and more durable. Oil-resistant coating to keep the screen clean. Quad band HSDPA / HSUPA that can allow multiple carriers. Games: Zynga’s Farmville and Activisions’s Guitar Hero will be coming to the App Store. iBooks: iBooks for iPhone will have the same features as the iPad version and it will be free. iOS 4: iOS 4 update is free June 21st with hundreds of new features. iTunes 9.2 is coming soon. Jobs may have dropped a hint that could mean a new iPad with camera is coming soon. I could be wrong here but Jobs said that Apple will ship “tens of millions of facetime devices this year, so there’s going to be plenty of people to talk to”. Is Jobs talking about just the iPhone alone or does he know there are new iPads hitting the market before Christmas? Maybe a new iPod Touch with front-facing camera? We’ll see. I’m hoping for the iPad! There were also new features added for iBooks on the iPad. iBooks is adding new features for bookmarks, note taking and PDF viewing. Stay tuned for more info throughout the week on other key features from the WWDC10…..
WWDC10 conference in San Fransisco. The conference will run from June 7th-11th. Steve Jobs will appear today (Monday) to announce the new iPhone and a lot of other great Apple features. I hope Apple’s Keynotes and presentations go a lot smoother than Google’s did. Google had some mishaps and failed presentations. During the new Android improvements presentation a lot of apps failed to work and the phone they were using had a call on hold for 12 minutes. The Google TV presentation had some hang ups and failure. I will have updates later in the day and all week during the WWDC10. *Update: Cupidtino just Tweeted – “’twas the night before WWDC, and the new iPhone launch….”. Further confirming the iPhone launch! Monday it is rumored that the new iPhone will be announced by Steve Jobs at the WWDC10. There are some other rumors that the iPhone will be available on Monday which was leaked. Another rumor has a June 18th release date. The iPhone HD or whatever it will be called should make an appearance. If it doesn’t many Apple fans will be let down. I am hoping for a larger screen like on the EVO. It may be awkward to hold but it is better for browsing and typing on the keyboard. At the Google I/O, Google pulled an Oprah moment and gave all of their audience (developers) a free Nexus One and an EVO 4G before it was available to the public. My belief is that Apple will try to one up Google and give the new iPhone to their audience along with another new gadget. To compete with Google they will probably hand out other great freebies. What about a new iPod Touch HD? Many believe the following will be announced Monday and let’s hope they are right. Apple is expected to announce a new Apple TV which will be similar or even better than Google TV. The OS 4 is older news and we already know most of the details already. Safari 5 may make an appearance. Mac OS 10.7 is also highly anticipated.There may be some improvements and added functions to the OS. I am expecting a new iPod to keep up with Zune and other companies that seem to be pushing the envelope. Apple never backs down to a challenge and they always seem to one up the competition. My guess is maybe a bigger HD screen and more storage? 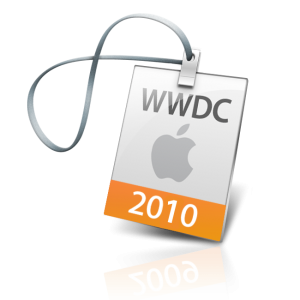 I am excited about the WWDC10. I was hoping to go but it was sold out before I could buy a ticket. I will be buying the new iPhone when it is released. I am also hoping they will announce a new iPad with a camera and an OLED screen. I will buy that one! The new iPhone will have a new design as we have seen many times. The iPhone is being called the 4G but it will continue to run on the 3G network. AT&T is testing a new 4g network and it won’t be release for a while. The new iPhone will be faster. Have you seen the EVO in action? You tap an application and before you remove your finger the app is displayed. Let’s hope that is how the new iPhone will run. 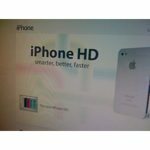 There is a picture (below) that names the iPhone the iPhone HD. There are a lot of guesses and rumors on the new iPhone’s name. I believe it will be called the iPhone HD. I’m also going with the iPhone 4 HD. They may pull a HTC and name it something like “iPhone Amazing” or “iPhone Brilliant”. What do you think the new name will be? What Will The New iPhone Be Named?